The Upper James River Water Trail in Botetourt County in Virginia&apos;s Blue Ridge is one of the best lazy rivers in the country for a summer float, according to a new article by Travel Channel. The story is a feature on "21 Lazy Rivers to Float This Summer" and was written by Kassondra Cloos, who was assisted by Visit Virginia&apos;s Blue Ridge with content about the region. The James River made the list along with other along with other scenic waterways in the United States, including the Snake River in Idaho, French Broad River in North Carolina, Russian River in California, and Trinity River in Texas. The Upper James River Water Trail is a fantastic spot for a day of floating, and local outfitter Twin River Outfitters is the perfect resource for tubing and kayak rentals, as well as offering options for day and overnight trips. Once you&apos;ve finished your float, you can also enjoy the locally-grown and produced wine in Virginia&apos;s Blue Ridge at the three wineries and vineyards that make up the Wine Trail of Botetourt County. 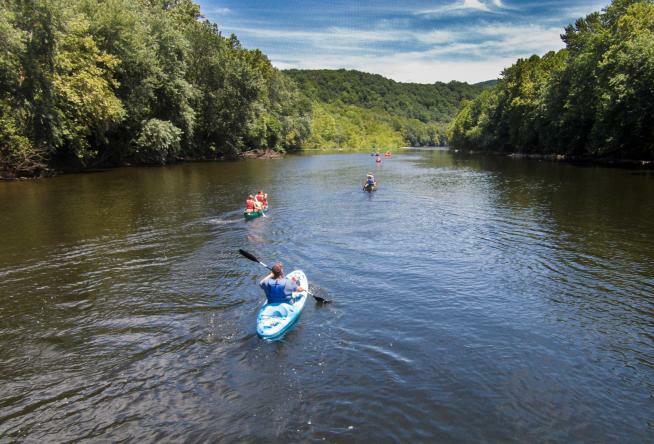 You can also visit the Upper James River Water Trail website to learn more about this beautiful blueway in Virginia&apos;s Blue Ridge Mountains.